Scream Factory has been on a roll in 2016. They have upped their game by offering new 2K and, sometimes, 4K transfers (of course downscaled to 1080p) and have upped their game in the features department as well, offering features like workprint versions, as well as tv edits. 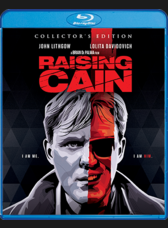 When they announced that they had acquired Raising Cain, the 1992 thriller starring John Lithgow and directed by Brian DePalma, I got really excited. I had watched the film upon release back in 1992 with my parents and the film left a lasting impression. Universal wasn't doing anything with the film, throwing it out on dvd with a dated master and no special features. Now that Scream had it, I knew that we would get a truly special package. I was not wrong. All of the special features are brand new and they look to be informative. I am looking forward to the Director's Cut the most as that has never been released before and I would like to see how the film differs between the two versions.